We provide UTP and STP copper backbone cabling for LAN/WAN. 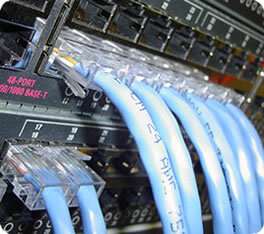 M&L Technical Systems also offers end-to-end cabling system solutions for our customers. We test and certify to provide our customers with complete, comprehensive reports on every connection within their facilities. With distribution and management of multimedia audio, data, and video, we make sure our customers are set up with high-quality cabling for all of their needs.